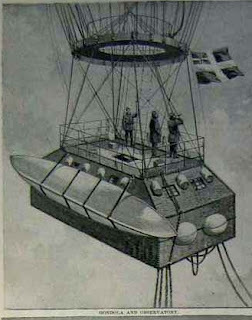 Therefore it should be the initial project of a balloon basket in which Salomon August Andrée with two companions wanted to fly from Spitzbergen to the North Pole. Intrigued by Payer I copied and placed the interesting picture without further examination on Google+ and Twitter. Soon after that the attentive reader Gustav Vávra pointed out that the picture is not the original proposal of Andrée's basket, but rather a gondola of the anterior and unrealized project of the French flight to the North Pole. My first reaction was to quickly write a short correction. After few days of further examination the whole affair became quite complex and not so so clear at all. Let us remind few basic facts on Andrée's attempt for the North Pole (his expedition could better be the subject of a long feature article, if not the entire website). than reported "original design" seen above. S. A. Andrée, Nils Strindberg and Knut Hjalmar Ferdinand Frænkel, all Swedes, 11. července 1897 began their flight to North Pole in the hydrogen balloon Örnen (Eagle in Swedish; made in France). Due to the leakage of hydrogen they barely reached 83rd parallel north. On their journey back they managed to get across pack-ice to the White Island near Svalbard. All of them soon died here (probably in October 1897). The cause of their deaths is not fully clear yet. How did it happen that the image of the comfortable gondola with four rooms, of which two (superimposed) were designed for dogs, in the Golden Prague? For the answer we must return seven years ago. 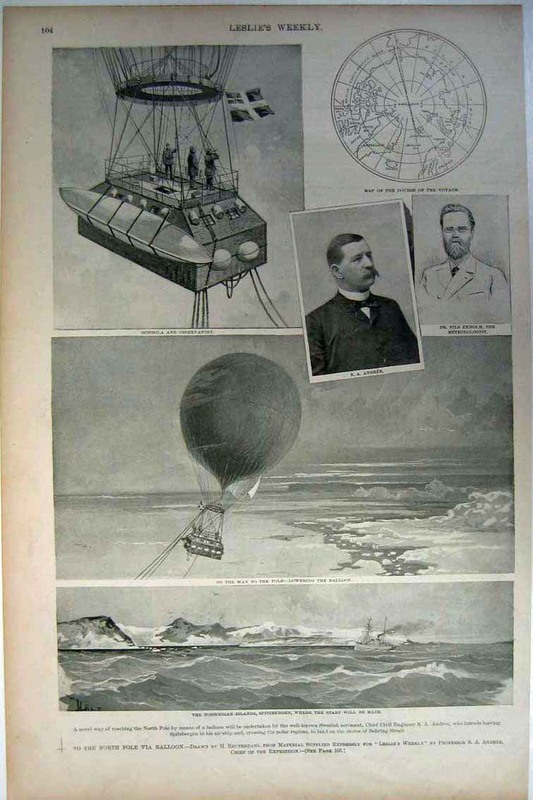 In 1890 the French weekly L'Illustration publishes an articel VOYAGE AU PÔLE NORD EN BALLON. It describes a plan by two young French ("the older not yet in his thirty", emphasises its author Guy Tomel) to fly from Svalbard over the North Pole to the Northern America or Asia. Names of the daredevils were Gustave Hermite and Georges Besançon. The flight of the balloon Sivel (this name was like nomen omen for attempts to reach the pole by balloons and airships, see "Who was Theodore Henri Sivel") had to help to chart unknown polar lands. Hydrogen to the main balloon should be transferred from 16 auxiliary small balloons attached to the periphery of the Sivel's netting to compensate any loss of gas. Empty envelope of a small auxiliary balloon would be then thrown away to decrease the dead weight of the aerostat. The basket, unbreakable and unsinkable, would have 3.4 x 5.1 meters and carry 5 men, 8 dogs, a sledge, a bout and provisions for one month.. The planned costs were 560,000 French franks – 60 thousand for Sivel and the rest for transport costs, provisions and scientific equipment. Who was Theodore Henri Sivel? 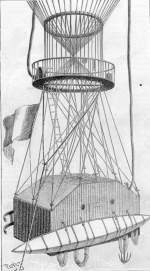 The man, whose name was given to the proposed French polar balloon, was a balloonist himself. French navy officer and his two comrades, Joseph Croce-Spinelli and Gaston Tissandier, attempted on April 16, 1875 for balloon altitude record (and scientific measurement of high atmoshere, too). 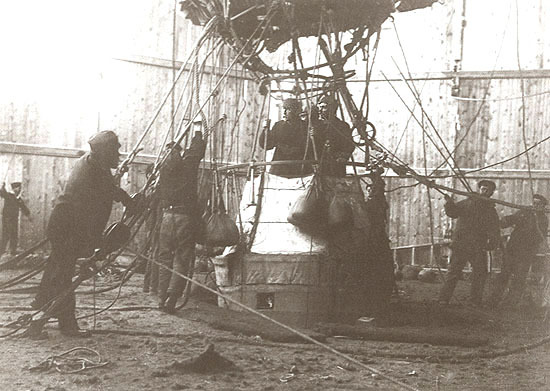 According to their barometer their balloon Zenith reached altitude almost 8,600 meters (lower than the contemporary record). Sivel and Groce-Spinelli died due to lack of oxygen and quick pressure changes. There are no Hermite nor Besançon over Arctic in 1892 but their names are connected with this year after all and enter the history. 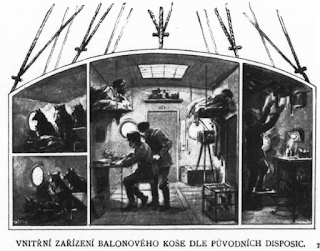 The history of meteorology at least as they launch very first atmospheric balloon probe. They colaborate in this field for many years but it is out of scope of this article. Why they did not realize their North Pole project is unknown (to me, at least). Maybe some reader knows more and can tell us in a comment? This text was created to dismiss wrong information that the basket of the French project was actually originally designed for Andrée's Eagle. But... Actually, what does Swedish engineer about the year 1890? He learns to flight in balloon. In France. His teacher is Mr. Besancon... (yes, that Besancon). Let us have a look at some interesting similarities of both projects. The Sivel should launch in July 890 from Svalbard. The Eagle launcesh on July 11, 1897 from Svalbard..
Andrée tried to control his Eagle Orla by ropes and sails. Balance ropes should help to keep the Eagle in desired height not to loose too much hydrogen. While theoretically the balloon should be be slower than air around it thanks to ropes and thus become dirigible by sails, in fact ropes almost caused instant sinking of the basket and its crew when the Eagle quickly descended to the sea level after its launch. 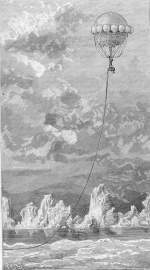 The Sivel had also to use ropes, but only for altitude stabilization to make possible charting of polar regions. Not to be misinterpreted: similar problem needs the same or similar solution and it is no shame to be inspired by ancestors and learn from them. Andrée almost certainly knew about the French project and his usage of the same or similar technical solutions proposed by his balloon teacher is nothing strange nor condemnable. But one thing is strange. Already mentioned Gustav Vávra wrote me: "I even found a picture of the gondola of the French balloon with Swedish flag (!) and presented as Andrée's balloon. It must be contemporary 'fake', not present one: that flag has a union mark placed in its canton as Andrée's flag did - it would hardly come to mind of anyone today." I searched on the web for the French gondola with Swedish flag and found few quite interesting facts. Almost the same gondola, only with Swedish flag. There are three path of investigation: 1) S. A. Andrée personally adapted the French image, added Swedish flag and exclusively copied the French map (today we could say "stole intellectual property") 2) H. Reuterdahl was not happy with exclusively provided material and copied and adapted drawings of French project. As Sweden he improved it by the right Swedish flag with no problem, 3) Reuterdahl draw published paintings, but he was instructed by Andrée to do so. I personally (just my guess) dismiss version 2. It seems too improbable to me that a painter invents a modified gondola. Versions 1) a 3) mean that the perpetrator was Andrée. And if he was not a good cartoonist (I know nothing about it) the most probable version is 3. Author of this article does not know about any case Andrée cited the French project as his source of inspiration. If he really forget to mention it as his source than we can say he did not act entirely honestly. In any case, his death in Arctic was too cruel punishment for this. And what about our old journalist from the Golden Prague? It is possible he really just reused the drawing of the gondola of the Sivel as it is not known whether Andrée published this cross-sectional view of the French basket as his work, too. On the other hand, the journalist could use picutres published by Andrée in some other paper. Almost certainly he did not know about the whole context which we, using work of kind people who are scanning and making accessible old papers, can find from our living rooms in few days. Fascinating! I haven't ever heard about that French plan to get to the North Pole. Please keep on writting in English, some other people like me, non native English speakers,will thank you the effort!